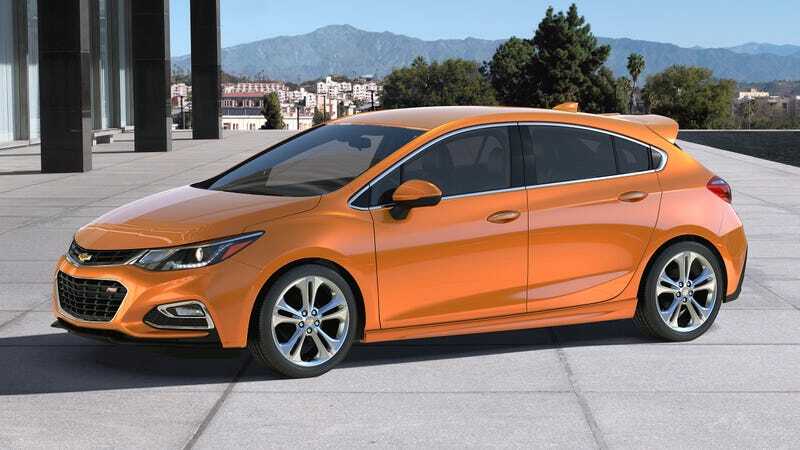 GM just keeps churning out new production-ready economy cars recently, with a new hybrid Volt, an all-electric Bolt showing up today at CES, an all new Cruze sedan, and now this: The Chevy Cruze 5-door hatchback. Europe has had a 5-door version of the Chevy Cruze with the first-generation, and now us over here in ‘Merica get to take part in the extra liters gallons of cargo space with the second generation Cruze, introduced in sedan form last summer. Rejoice! No seriously, really rejoice because I don’t think it looks bad at all. Chevy says the new Cruze hatch will go on sale in fall of 2016, citing a “nine percent market growth in small hatchbacks last year” for validation. All Cruze models come with the same 1.4 liter turbo inline-four, cruising along with 153 horsepower and 177 lb-ft of torque. Oddly there’s no mention of transmission options just yet. The new model will also come standard with Apple CarPlay and Android Auto capability, as well as Chevy’s new MyLink infotainment system. The car also comes with a slew of safety systems, with Chevy claiming more than the Corolla and Civic, including lane assist, rear-parking assist, blind spot warning, and something called rear-cross traffic alert. The hatch will be sold in three available trims in North America — LT, Premium, and RS (which doesn’t see any engine upgrades, just sportier styling), while the Cruze sedan comes with five, including lower L and LS trim levels. It will also be interesting to see how sales of the 5-door Cruze and the new Chevy Bolt compete, with similar styling elements but one shocking difference. Chevy says that 35 percent of Cruze owners are new to the brand, and that the Cruze is the brand’s best-selling car in the world at 3.5 million cars sold, with Chevrolet’s compact segment share growing by 3.6 percent. We’ll get more details at this month’s Detroit Auto Show. More decent-looking hatchbacks! Yay! Now rally it, Chevy.